As I researched Thor I came across an older image of the God from earlier Germanic Legends. Back then Donar was the King of the Gods, and he ruled the heavens as indicated by a crown of stars that encircled his head. He did not have a hammer, but instead threw stones from the sky, and his chariot was pulled across the sky by two goats; but in the German version his cart was filled with copper kettles in order to explain all the racket a storm caused. The idea of King Thor really seemed right to me. In particular the idea of his “Crown of Stars” conjured a nice image to my mind. So I latched onto that and worked up my portrait. 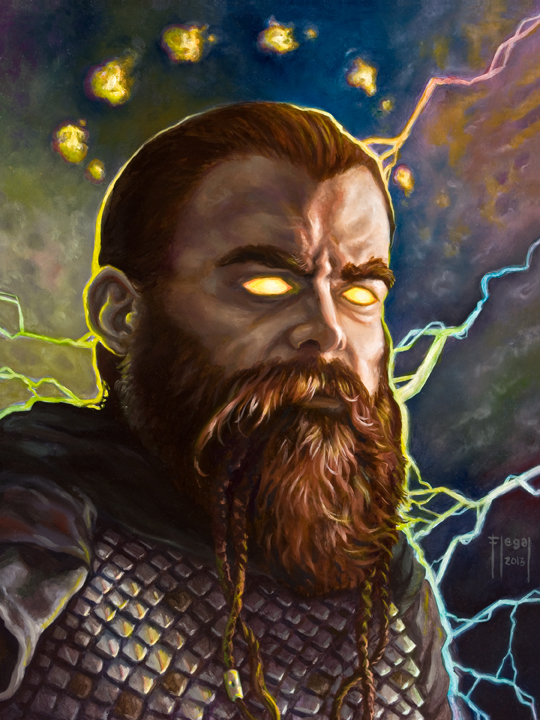 If you’re interested in reading more about Thor or any of the other Northern Gods, I recommend the Norse Mythology Blog by Dr. Karl E. H. Seigfried. It’s a great starting point and he recommends lots of other books to get into. The original fantasy painting was done in oil and measures 11" x 14".